“I am delighted to offer my support to the 2nd U.K. Taiko Festival. 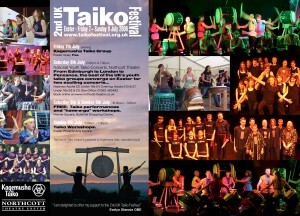 I am particularly excited about it because of the strong focus on youth taiko this year.” Evelyn Glennie. Black Dragon Drums, Kagemusha Junior Taiko, Maidenhead Taiko, QEC Crediton, Sakura Taiko, Tanoshii Taiko, Umi No Taiko. See also: 1st UKTF; 3rd UKTF; 4th UKTF; 5th UKTF; 6th UKTF; 7th UKTF; 8th UKTF; 9th UKTF; 10th UKTF; 11th UKTF; 12th UKTF.